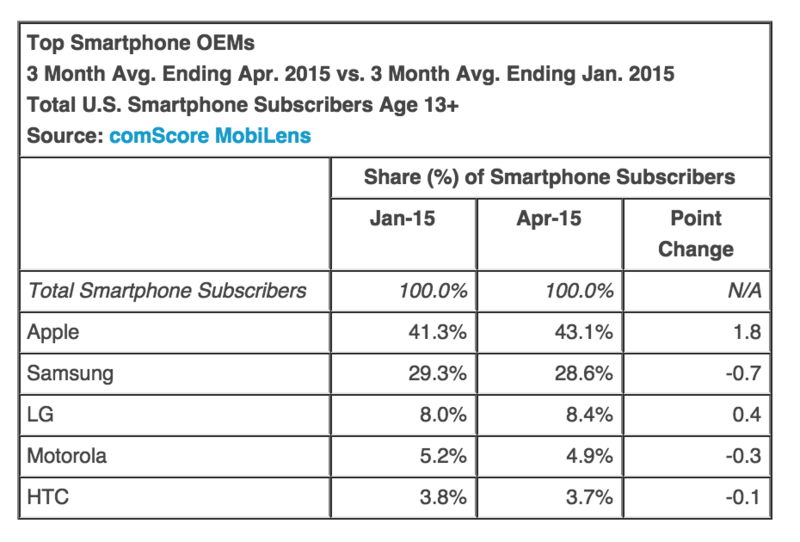 ComScore has recently published their report on Smartphone subscriber market share and Apple has not only maintained their lead over the industry, but also managed to gain 1.8% marketshare, between 3 month average ending April 2015 vs 3 month average ending January 2015. Considering that the newest version of the Apple iPhone – the 6 and 6 Plus were released back in September 2014, it is rather surprising that their marketshare continues to increase 6 months later. The nearest competitor Samsung has lost 0.7 percent marketshare, but this data does not include the release of their newest flagship smartphone the Samsung Galaxy S6 and S6 Edge – which were both released in May 2015. Other smartphone manufacturers were negatively affected as well, with the exception of LG, who managed to gained 0.4% points, and their marketshare will most likely increase as soon as the LG G4 sales are accounted for (released this month – June 2015), which touts important Android features such as removable battery and expandable memory. HTC has also lost marketshare and will probably continue to do so, since their latest flagship phone the HTC One M9 was released April 2015 and in recent news, wrote off a substantial amount due to slower demands in China and poor high end sales. 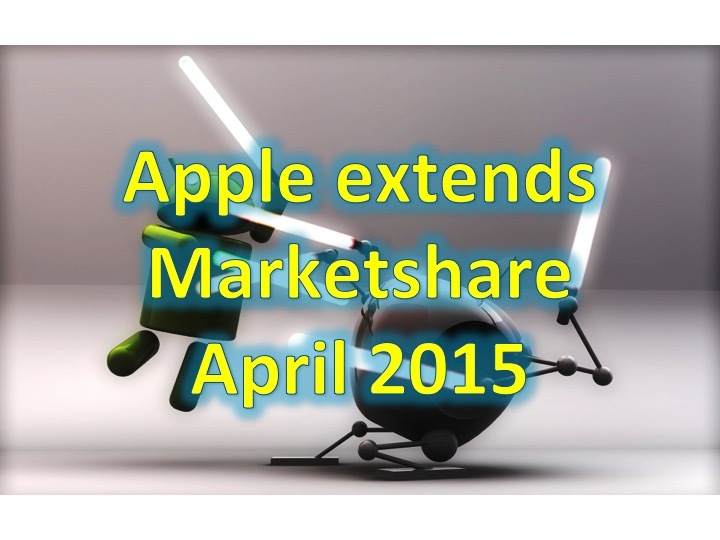 In regards to smartphone platforms, Android has maintained their lead over Apple, but has lost 1 percent marketshare. Apple has increased by 1.8%. 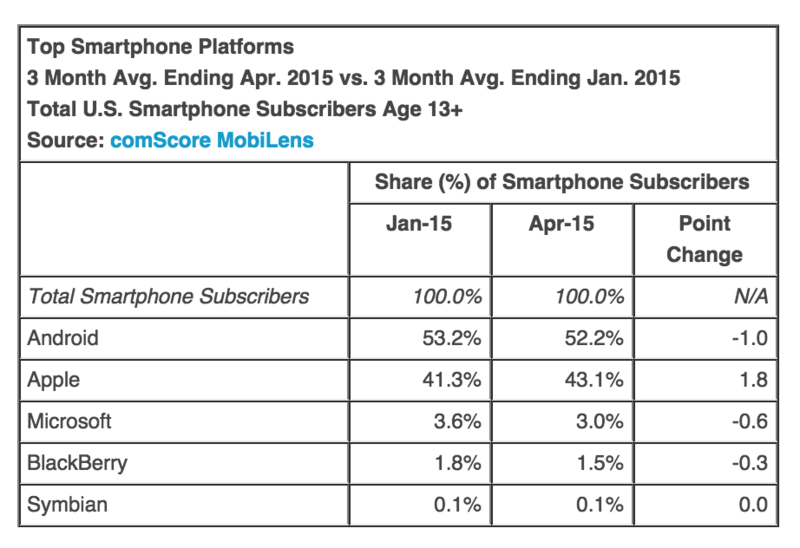 Both Microsoft’s Windows Phone OS and BlackBerry lost 0.6 and 0.3 percent marketshare, respectively. With Microsoft Windows Phone 10 in the horizon (coming at the end of the month) and new partners to create Windows Phones (also to reduce reliance on Android), their market share might show a considerable uptick in the 3rd quarter. BlackBerry’s newest smartphone the BlackBerry Leap, and one of our favorite phones – the BlackBerry Passport, couldn’t help sales in relation to market growth as the company now only has 1.5% marketshare.